One of today’s fashions is to start with several apparently disparate mysteries and spend the rest of the book making the connections. 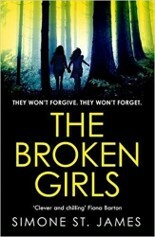 In The Broken Girls events are separated by 64 years but the setting remains static: a small town in Vermont. Who is the nameless girl racing through the woods, chased by monsters in 1950? And how does she relate to Fiona, a journalist lingering near the same woods in 2018, not hunted but haunted by the murder of her sister twenty years ago, her body dumped in the grounds of a derelict mansion called Idlewild, her boyfriend convicted and now serving time in a secure penitentiary, always protesting his innocence? In 1950 Idlewild Hall was a grim Victorian pile: a boarding school housing “unsalvageable” girls whose families had sent them there because for one reason or another they were unmanageable. Some were illegitimate, others violent or withdrawn; all were neurotic - and they were incarcerated in a building frequented by the ghost of yet another abused girl. In such a volatile atmosphere four room-mates bonded, three of them slowly revealing their backgrounds to each other; only French Sonia, the orphan, unable to do more than mention a childhood spent in concentration camps, mute regarding any details. So, Sonia was the baby of the quartet, cossetted by the others, by CeCe, the deceptively stupid fatty who had escaped drowning, by Roberta, traumatised after witnessing an attempted suicide, and by Katie who was raped. Sonia went on a visit to distant relatives. On her return she caught the bus back to school and was never seen again. Her room-mates were left devastated. Soon the school closed; the mansion was abandoned and vandalized, to be bought 64 years later by a rich widow, and Fiona, the inquisitive reporter, ensnared by this place where her sister died, is appalled and fascinated by the proposal to restore Idlewild and re-open it as a girl’s boarding school. Convinced of ulterior motives it’s in her attempts to discover the widow’s true intentions that Fiona starts to antagonise the locals: her own partner who’s a cop, not to mention his belligerent father who was Chief of Police when her sister was murdered. Goaded by hostility Fiona widens her investigation into Idlewild’s history, tracing survivors, making connections, solving all the mysteries in a crime story redolent of abuse and haunted by ghosts.